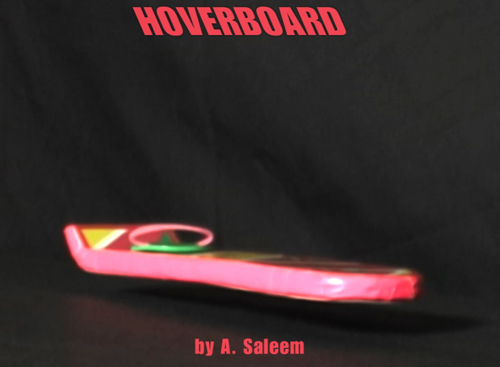 How to create a Hoverboard using neodymium magnets and a magnetic rf launchpad. Not sure if I should believe my eyes or not? I’d like to try that myself. @matthew – The video explains it all! how were you able to determined N and S poles? and how long did it take for it to start hovering? Is this possible or not?! I tried with some magnets I had lying around the house, don’t know if they were neodymium but got no levitation out of it. Please I would like to know if this is fake or not. This is not real. It is possible to levitate magnets with other magnets, see the Levitron top. The reason the Levitron works is because the top is a magnet and spinning it provides stability. There is nothing here to provide stability and the antenna would do absolutely nothing. For those who are wondering how to get the neodymium magnets. Neodymium magnets are the type of magnets that are contained in a computer’s hard drive. So, these are easy to obtain. If I am correct, this setup should create a transverse electromagnetic wave whose oscillations are perpendicular to the direction of propagation (energy transfer). These waves should be strong enough repel against the opposing changes of the magnetic fields of both the north and south facing neodymium magnets in order to provide lift for the board and keep it stable. Therefore, I can deem this theoretically possible and I will make an attempt to duplicate it. The only thing I’m wondering about is how the board stays airborne after the “Launchpad” is removed… Maybe something related to ratio of the wavelength to the size of the diffracting object? kinematic theory of diffraction? How about that teleport video that comes up after yours., Fake? This is amazing! But i have a few questions. How much weight does this support? And is it possible to reproduce this on a larger scale? Is it thrut Everything here? or it is videotriki?? ?Who unswer ? to Know which is n and s you think. s atracts to n but not s.
it dose not mater if n and s are in difrent spots. this works because n repels n away from it. Can humans stand on it if it was large enough? Can you push it around or does it have to stay in the same place? hi i asked a magnet maker to make me two 6/1/4 ” x 20mm magnets as two big magnets that i could have continually ionized, to have electromagnetic anti gravity, the engineer said it wouldnt work, they’re all in on this not to be used by anyone but the military. anyway it would work on a larger scale with a self contained battery pack as an attached launpad style power supply – batteries, magnets copper, power switch, launch gear, there is a guy that made one and exhibited it france, he didnt show it moving along above ground but displayed up on a platform. I find this hard to believe, I can see no evidence of wires but I would like to know what is hidden under under the charcoal black material. It wouldn’t happen to be a block of copper sitting in a bath of liquid nitrogen would it. I’m not saying this is impossible, because I believe anything is possible given the right conditions doing is believing video’s frequently lie! Excuse me, but what are the sizes (measurements, specifications) of the magnets? Thanks in forward. Where do i get the magnets? first he achieves levitation cause of the battery, because if you connect a battery to a metalic object it turn on a electro magnetic field.! I saw something like this on an episode of Star Trek The Next Generation called Contagen. ich glaube dieses viedeo schon aber ich habes versucht hat nicht geklappt welche Neodym-Magneten muss man da nehmen? What is the use of a loop antenna? Connections of the launch pad were not so clear. can you explain them again? Where to get the loop antenna? What did you mean by adjust and balance? How to adjust and balance? Is loop antenna required for sure of would a straight antenna work? Someone sent this to me and asked what I thought…and for all the builder hopefuls on here a couple notes; First, in reviewing all the comments, no one has taken into consideration the earths own magnetic field and influence separate from all the devices that are removed – essentially functions like a much bigger antenna surrounding the whole system. Second, if you’re trying to scale up, take into consideration the size of the antenna relative to the board and what its function is (consult a second year college engineering physics book). Third – you do not have to buy a loop antenna,it is just some metal wire surrounded by plastic, would be stronger if you made your own without plastic and different gauge/metal. Fourth – Scale up requires larger electrical energy supply and understanding of the physics of each component – gain that understanding and build a board you can ride around the living room. Good luck. I have built two of these myself. I used a very light balsa wood structure to build it, it works fine except that somehow they only last about 1/2 an hour, then they have to be polarized again. I do not understand why! What size and strength magnets should I use? Banana – Would you please tell me how you connected the battery, magnet and loop antenna? Thanks in advance! What do you use for the actual board? What is the loop antenna for?? Short circuit?? Can i also use a lamp or something like this so there is no short circuit? What are the materials for the hoverboard. It is possible in fact. There is the bullet train in Japan that is the exact same concept… but with a train. This proving that it can be mad to a larger scale and ca possibly be the future of hover boards. i believe this and does it have to be just neodymium magnets? ive got the loop antenna and the coathanger ready but not the magnets yet. 1) is anyone going to build a bigger one. 2) how can we make it shift forward only. I am currently working on a larger one. The hoverboard is probably made out of foam board. I’m trying to make it but I can’t get it to float. What am I doing wrong? Please let me konw how get i magnetic RF launch pad and what is it bottom of basement ? is it ironable or normal floor ? How are the loop antenna and metal hanger connected? Do you have to strip the coating off the wire? Alright, I bought a delorean toy car and I will put the magnets inside it, will it still work? And if it does, what is the use of the loop antenna? I can’t make this work, is there a specific connection needed between the hanger and the antenna? What is that green and pink thing you out into the baord? Is it necessary to use that? will you sell me a working setup? I found the decals simply by googling “BTTF2 Hoverboard decals” which let me to a forums page and a link to a PDF file I downloaded the file and whala had it. For the board material I am using foam poster board. You’ll need an exacto knife to cut it out, just cut out the decals then use the scrap paper to trace the outline on the board. I bought the neodymium or earth magnets at a craft store, you’ll need 8 and they are .5 inches x 12.7 mm. How the video shows to place them N “North” and S “South” you can figure out that by being aware that, “opposites attract” (in the magnetic world). YouTube has videos to help you out. For the loop antenna, I had one on an old stereo system, but they can be found at hobby shops, or you can follow youtube videos on how to make your own. The battery is a AA. I will post as I test it out, have fun! Thanks for all the descriptions, they’ll be put to good use in my next school project. This really shows that there are still individuals that value what they submit on the web. I truly loved reading the comments. Can someone tell me how this floats? Is the board repelling another magnet on the table in order for it to stay in the air? how would i get the print of the design. Please tell your viewers what it is made of and they just might give you 1000000000$. And I recommend you giving a link to your YouTube video on how to make it please? Can anyone tell me how to connect the antenna to the hanger and what is the hanger made up of ,I mean what metal? You can make theese and sell em for like 75 to 100 $ each and make a huge profit i know some people who want a real hover board for 250$ wow!